Finding your dream home has never been simpler. Below you will find 10 reasons why it's important to rely on the support of an advisor, and how we can help instill confidence in the decisions that you will be making. Even with all the tools and technology at your fingertips, you will still want someone there who has done it several times, successfully. Do you actually need an agent when you buy a home? Yes, you do. While there’s no requirement that you have a buyer’s agent, it makes a lot of sense. After all, the home seller has an agent working on his or her behalf, looking out for their best interests. However, who protects you, the buyer, during the process? The answer – a buyer’s agent. In addition to that essential protection, there’s another significant benefit you gain. A buyer’s agent is usually free. The seller is responsible for paying for those services. What can we do as your buyer’s agent? Actually, we can provide you with a great deal of value, and protection that should not be sacrificed. 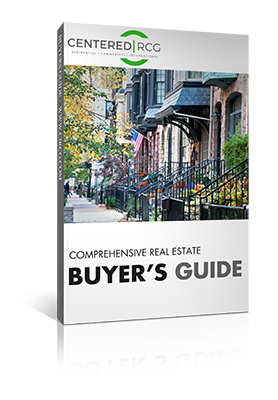 Here are 10 of the most important ways you benefit with an CENTERED | RCG buyer’s agent on your side. How much do you know about the complicated process of buying a home? With a buyer’s agent, you don’t need to worry that you’ve missed something small, but crucial. We not only value our relationships with our clients, we also value the relationships with other agents. Why? Because they are connections to available properties you may not find on the market. Working with an CENTERED | RCG buyer’s agent, you will be exposed to both on and off-market properties, increasing your chances of successfully finding the perfect home. There’s a lot of hassle involved with buying a home, particularly a new home. The seller’s agent will hound you, trying to pin you down to an agreement that works in their favor. We spare you all of that. How much do you know about the specific area where the home is located? A buyer’s agent either knows the area perfectly, including all the potential problems, or knows where to find that information. This can prevent serious problems down the road. Local real estate market trends can be tough to discern for the inexperienced, but it is crucial that you are “in the know”. A buyer’s agent ensures that you understand prevailing conditions and can take the correct steps moving forward. A buyer’s agent can advise you on the convoluted pricing on homes, ensuring that you’re paying a fair price. Buying a home often means needing the services of many professionals, from home inspectors to contractors. A buyer’s agent works with these professionals regularly, and can help you make those connections. When you work with a buyer’s agent, you’re working with a professional capable of removing him or herself from the emotion of the moment. This allows the agent to negotiate with clarity. Unless you’ve closed on real estate deals multiple times, and often even then, you’ll be left with a lot of unanswered questions after closing. A buyer’s agent can provide you with invaluable guidance during this time. CENTERED | RCG buyer’s agents do a great deal for their clients, and continue to do so even after your closing. There’s a very good reason for that. They hope to form long-term relationships that lead to referrals. It’s the basis for their career and the key to a successful future. Contact CENTERED | RCG today to learn more.